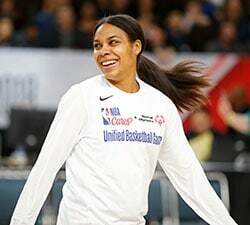 NEW YORK – Kelsey Plum arrived at the University of Washington four years ago with plenty of hype, having already won a gold medal with USA Basketball and played in the McDonald’s All-American Game. She was just the second McDonald’s All-American in program history. But, when Plum dropped 32 points in her first game for UW, only 400 people were in attendance to witness the thrilling debut. Plum was different for picking Washington. A native of the San Diego area, she went north to join a program that hadn’t been to the NCAA Tournament since 2007. It had been a full decade since the Huskies were ranked in the AP poll. Those pictures exemplify the impact Kelsey Plum had on her college team. Not only did the Huskies go to three straight NCAA Tournaments – including their first-ever Final Four in 2016 – but they regularly sold out Pac-12 games late in Plum’s senior year. Thanks in large part to Plum, the Washington program is in a much better place as she and her senior teammates depart. Now, as she takes her game to the professional level, her next team will be hoping Plum can be one of the pieces that helps them become a contender once again. Holding the top selection for the first time in franchise history, San Antonio made Plum the No. 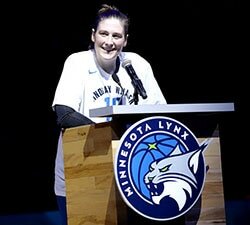 1 overall pick at Thursday’s WNBA Draft in New York City. The Stars have finished at the bottom of the standings each of the past two years, but Plum joins a group that features talented guards Kayla McBride and Moriah Jefferson. Plum told her mom when she was 10 that she would play in the WNBA one day. On Thursday, her mom was among those sitting by her side as she was announced as the No. 1 pick in the draft. There was speculation the Stars would trade the top pick, given that McBride is an All-Star shooting guard and that the team used its No. 2 pick on Jefferson last year. But Plum’s proven ability to step in and help a team right away was too much to pass up. Oh, and she’s the best scorer in women’s college basketball history. As the Huskies won a program-record 29 games this year, Plum set the NCAA single-season record with 1,109 points on an average of 31.7 per game. She finished her four-year career with 3,527 points, surpassing Jackie Stiles for the most all time. Plum’s senior-season numbers are staggering: In addition to her 31.7 points per game, the 5-8 lefty averaged 5.1 rebounds and 4.8 assists while shooting 52.9 percent from the field and 42.8 percent from the three-point line. Plum swept college basketball’s National Player of the Year awards after the historic season. 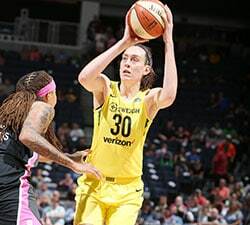 Plum started garnering awards as early as her first year at Washington, but she will be the first to admit the player entering the WNBA is completely different than the freshman version. Her first season, Plum shot just 39.3 percent from the field and 36.7 percent from deep, and she finished the year with more turnovers than assists. Plum increased her assist totals every season, but she still turned it over too often as a junior. Then as a senior, Plum finished with almost a 2-to-1 assist-to-turnover ratio and proved to be a much more efficient scorer, going from 25.9 to nearly 32 points per game despite fewer shot attempts. As impressive as her numbers are, it’s Plum’s work ethic that has set her apart since day one. When she first arrived on campus at Washington, Plum was coming back from a three-week trip in Lithuania with the USA U-19 team, and she was back in the gym that same day working on her game. Plum then got in the habit of completing early-morning workouts before class, and she convinced her older teammates to join her. She was the definition of a gym rat, constantly getting extra shots up before and after practice. Now, we wait and see how far that work ethic can take her in San Antonio, and whether she can have the same profound impact she did in Seattle.